Prada is a luxury and prestigious designer brand. Existing almost over a century ago, when Mario Prada first set up the business in 1913. They initially made exclusive leather bags and accessories handcrafted with the finest materials using sophisticated techniques. To this day Prada still live by making exclusive products, for an elite group of people, which is what makes them so popular. In 1999 Prada’s eyewear range was launched, once joining with the De Rigo Group, the range was an instant success. 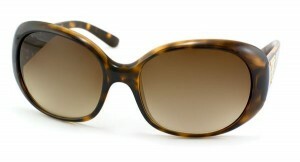 The Prada PR17LS sunglasses are a current best-seller made for women. The glasses combine classic and contemporary designs beautifully. The chic oversized glasses are a very glamorous 70s look but these glasses are modern because the arms are wider than ordinary glasses. The wider temples mean that the oversized lenses are accentuated. The PR17LS glasses are made of fine, thick acetate which is comfortable and light. The lens shape is oval and round and this style is very trendy and chic. This style is popular with women as it suits most face shapes and is so fashionable. This model is timeless and will always be in style regardless of the era. These glasses are available in different colours but the Havana and brown gradient is the best-selling shade. Tortoise pattern will always be stylish and elegant, matching any outfit and personal trend. 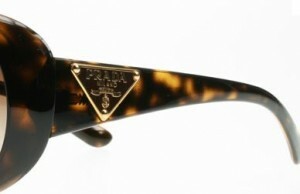 The PR17LS Prada frames have the iconic triangular Prada logo plaque on the temple arms. The simple, classic and triangle logo represents Prada’s identity to the world. Prada products are inspired from the observation of the world, society and culture which is the core of Prada’s creativity and modernity. Prada back in 1919 was the official supplier to the Italian Royal family and European aristocracy. Now, decades on, it is clear to see that the brand still caters for a prestigious audience using only the best of the best.